Unfortunately no kids came knocking to trick or treat last night and so we had to barbecue something out of the fridge instead. This morning we prepared the RV for the road and travelled all of ½ mile to the Wal-Mart store next door. After parking up we made for the bus stop outside and caught the 09:38 to Patriots Point www.PatriotsPoint.org which is about 6 miles down the road. 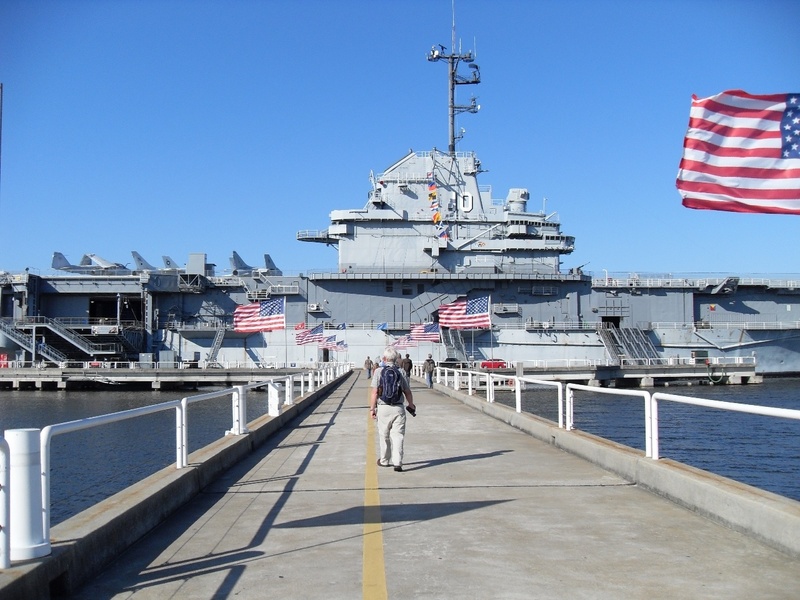 I particularly wanted to have a look around the USS Yorktown as her size would be similar to aircraft carriers I had served on in the Royal Navy. 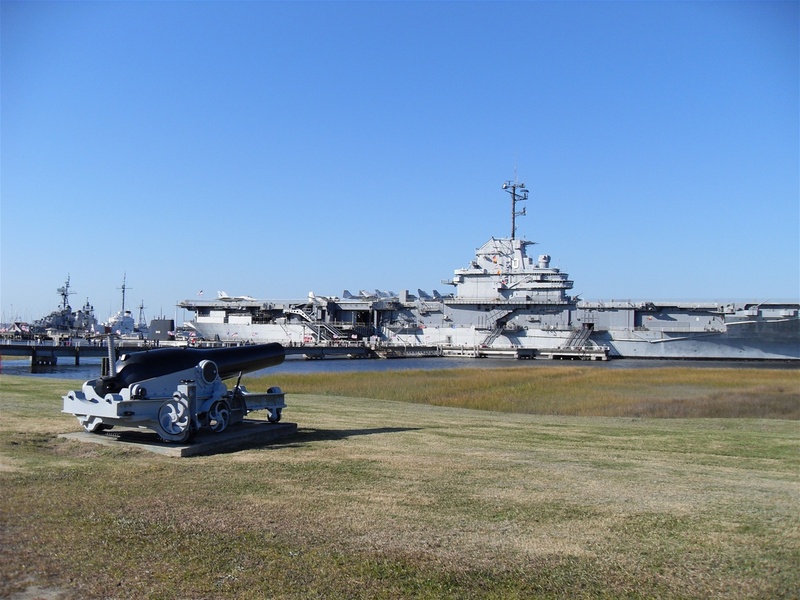 The plan was for us to look around the ships there and then catch a ferry across to Fort Sumter. 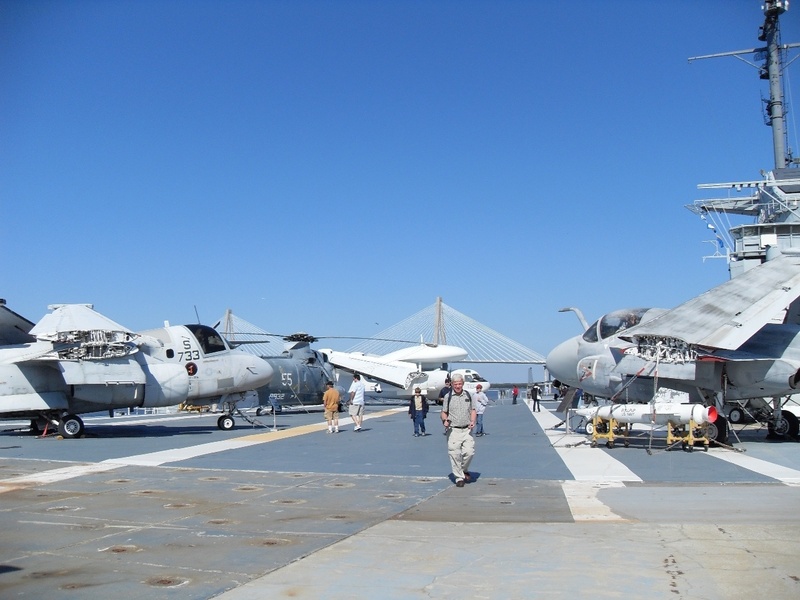 The look around the USS Yorktown was interesting and bought back a lot of memories, there were an awful lot of similarities between her and the aircraft carriers I had served on, and I was able to explain to Rosina what things were and how they functioned. I remembered how, in my late teens, I could slide down the steep step ladders between decks no problem but wouldn’t try it now. The one thing which amazed me was that she still had the wooden flight deck, although it had a coating of paint or something over it which had come away in places revealing the wood. In WWII the US Navy learned during battles in the Pacific that wooden flight decks, often damp with oil and aviation fluid burnt fiercely when ignited, in fact this ship was named in honour of the previous USS Yorktown which was lost during the Battle of Midway, yet here she was, having served from1943 up until 1970, with propeller and jet aircraft flying off her, still equipped with a wooden deck. There were some interesting exhibits in the hanger including the 'Medal of Honor Museum', and the various aircraft up on deck. After a good look round we went to the snack bar in the hanger for a light lunch. I then suggested to The Chef that as time was getting on we should forget about looking round the other ships and go straight to Fort Sumter, but on arrival at the jetty found that we had missed the last ferry over there. I thought they were running every hour but there were only two sailings today and we’d missed the last one by 30 minutes. It was annoying but we knew in our hearts that it would probably have been just more brick walls, cannons and cannon balls and we’d seen lots of them on this trip, but it was nonetheless an historical site which we’d missed the chance of seeing. With nothing else to do we had a look around USS Laffey, which, during WWII in one raid alone, was hit by two bombs and 5 Kamikaze planes and still survived, with the heroic crew earning her the nickname ‘The Ship That Would Not Die’ and worthy of repair. It was another interesting tour after which we sat up on her deck and relaxed in the sun. The Chef wasn’t too keen to tour the submarine USS Clamagore which was understandable as they are a bit tight for space below deck, so I didn’t bother either. 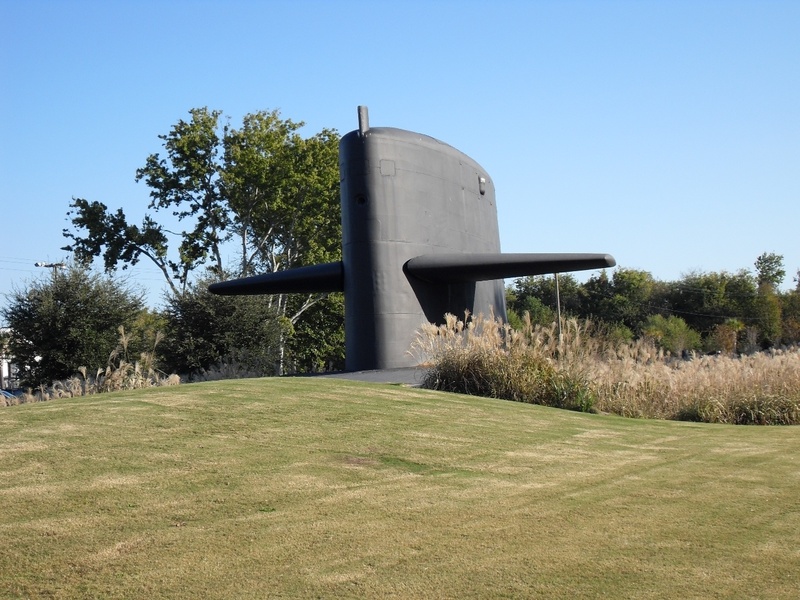 What I did enjoy though was The Cold War Submarine Memorial incorporating the actual sail (conning tower) and rudder of the former USS Lewis And Clark SSBN 644. With clever landscaping of the ground around them and the planting of rushes and grasses it looked like a full sized Fleet Ballistic Submarine moving through the ocean creating a wake and throwing up spray. 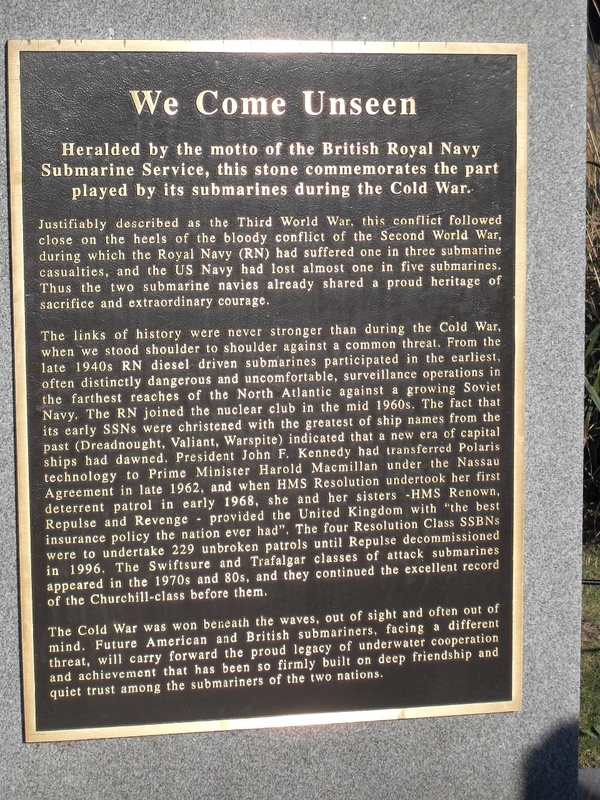 What was also nice was that the memorial also gave recognition to those who served in the submarine service of the Royal Navy during that same Cold War period. With our visit complete we caught a bus back to our Wal-Mart store-come-campground for the night. This car park has the potential to give us a quiet night as it isn’t near a busy main highway which so many of them are. Having popped in to the store for some shopping we settled down for the evening. Tomorrow morning we’ll be popping back down the road to the Publix supermarket for some fresh bits and pieces before making our way down the coast to Beaufort a town we’ve decided to visit on the way to Savannah, Georgia. LOCATION TONIGHT: Wal-Mart, US17 North, Mount Pleasant, Charleston.